Syncbox Killer 360 Sound Design. The Killer 360 Sound Design. A 360 horror film for VR with Spatial Sound. 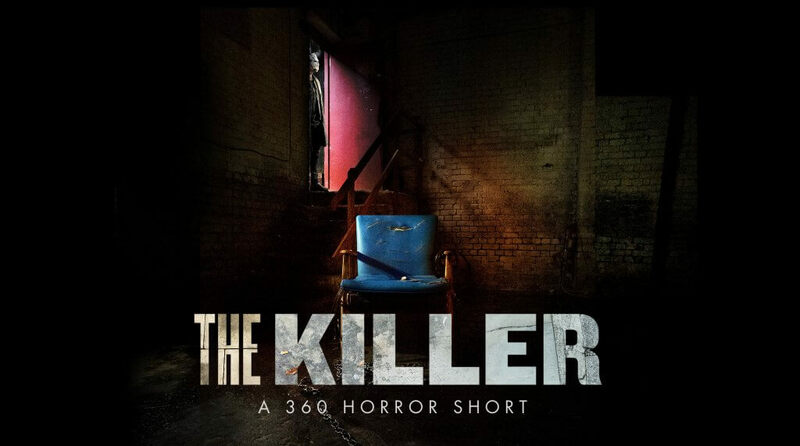 The Killer is a first-person psychological 360 video thriller. You are the captured and tortured prisoner of a merciless madman, experiencing the unimaginable as it unfolds around you in a dark, forgotten place. Be prepared to be kicked, spat on, pissed on, drugged, sworn at and engorged with bottles of cheap vodka by this relentless psychotic. And don’t expect him to stop there… Ever been burnt live? This 10 minute film has been beautifully filmed and stitched together to produce a very unique narrative horror film. The story unfolds around you, literally, Strapped to a chair you are helpless to prevent the lunatic torture you, mentally and physically. There is only one way out of the is nightmare. But in the end, it’s the twist that redefines the film and leaves a lasting impression no viewer will soon forget. The film was devised by Irresistible Films and VML and directed by Tom Stoddart. It’s dark in the mad man’s lair but everything has been filmed with VR in mind. The psychopathic killer is right in your face. Taunting you. Far too close for comfort. You can hear him breath right down the back of your neck. Included here is the trailer for the film. If you’d like to view the film as intended please grab a headset and a decent pair of headphones and click this link. Or you can catch it at Haunted Cinema a Pop-up VR cinema in Covent Garden, London. For over 50 years, Spitalfields Crypt Trust has offered a safe place for people to escape life on the streets of East London and recover from their addictions. Through social enterprises such as Paper & Cup and Restoration Station, they offer practical help, support and training to people who have been homeless and suffering from addiction. This film is all about bringing awareness to Homelessness. The film brings the psychopathic killer right into your face. The sound was mixed and designed to be as real as possible. Each sound is perfectly placed and mapped to create a frighteningly realistic scene, whichever way your are looking. He may be behind you or right in your face. The spacial head tracking keeps you on the move even when you may not be able to see him, you’ll certainly be able to hear him. Mixing 3D mulit-channel, virtual reality sound to a 360 Video brings the whole experience of VR to life. In a word, Audio Head Tracking enrols the user into believing they are really there and not just wearing a VR headset sitting on a chair. The film’s spatial audio was mixed and sculptured at Syncbox Post in London and represents the dedication and excitement we have for this technology. So much can be created and enjoyed when you mix in 3D as opposed to 2D. Please get in touch with Rich Evans if you have any projects you would like to discuss. Using the latest audio technology, we can mix your immersive audio or take your stereo mix and transform it into a 3D wonder world. Our experience of sound design and audio mixing adds a greater dimension to any 3D or VR mix. We can mix to all the latest formats including AmbiX, FuMa, Quad Binaural, Facebook 360 Video, You Tube 360 or provide you with an 8 channel audio file for embedding into your app or game player. Once rendered the VR Sound Design mix will provide 100% accurate head tracking and add authentic realism to any 360 video. We also provide real, end user monitoring experiences with an Oculus Rift VR mask and Samsung Gear VR. This enables you to see the finished product how it was designed to be seen and experienced. We’re dedicated to exploring this immersive technology and ways of how it can be used to enhance the users experience.